I made this crowd-pleasing cake over the weekend – super easy and delicious! I didn’t manage to get a picture before people dove in. Makes one 9×13 inch cake. 1. In a bowl, combine the sugar, flour, and cinnamon. 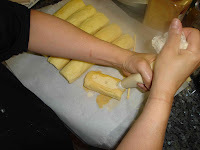 Blend with a pastry blender until the mixture forms small crumbs. 2. Stir in the nuts, if using. Refrigerate topping while making the batter. 1. Preheat oven at 350 degrees. Butter a 9-by-13-inch baking pan. 2. In a bowl, combine the flour, baking powder, baking soda, cinnamon, and salt. Whisk to blend them. 3. In an electric mixer, beat the butter until soft. Add both sugars and beat until fluffy. Beat in the eggs, one at a time, followed by the vanilla. 4. With the mixer set on its lowest speed, beat in the flour mixture alternately with the buttermilk or yogurt mixture, beginning and ending with flour. 5. Remove the mixer bowl from the stand. Fold in the apples just until blended. Transfer the batter to the pan, distributing evenly. Smooth the top with a spatula. 6. 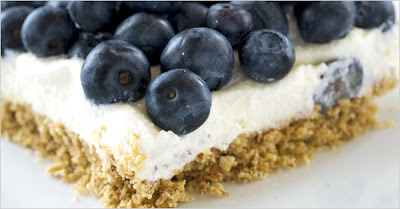 Scatter the topping over the cake in an even layer. 7. Bake the cake for 45 to 50 minutes or until a skewer inserted into the cake comes out clean. Let cool. Serve warm, cut into squares, maybe with a scoop of vanilla ice cream. 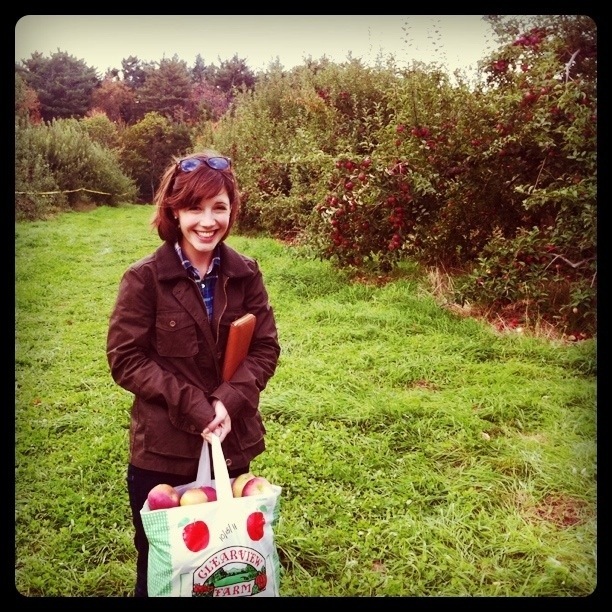 This past weekend, I did one of my favorite things – apple picking! Instead of going to Tougas Farm, where we’ve gone in the past, we opted for a less-crowded and smaller venue – Clearview Farm in Sterling, MA. While the parking situation was less chaotic and the farm wasn’t overrun with small children (pluses), I was disappointed to see that Clearview only had 4 varieties of apples (whereas Tougas has 15-20). 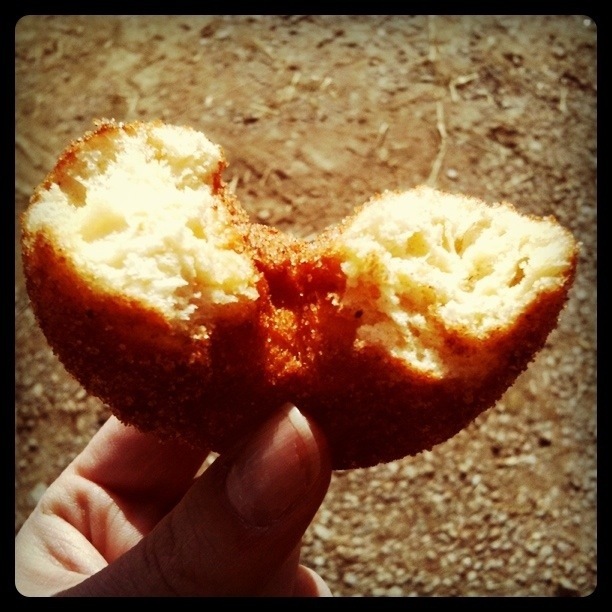 And, their apple cider donuts weren’t hot from the oven…although that did not stop me from eating several. In the past 5 days I have eaten: apple cider donuts, apple crisp, apple pie, AND apple dumplings. All delicious, but not exactly nutritious. While I’m certainly meeting my apple-a-day quota, I’m on the lookout for some healthy apple recipes. Since it’s been such a warm Fall thus far, there are still a couple more weeks of apple picking – go to Mass Pick-Your-Own to find an orchard near you. This recipe is best made with very ripe strawberries – ones that are just on the cusp of being overripe. If you can, use fresh, local berries – not the overgrown, mutant varieties that you’d find at the grocery store. This recipe was a combination of various found recipes and winging it. As you can see* by the amount of liquid hanging out in our pie, we obviously didn’t use enough cornstarch. Some recipes use gelatin as a thickening agent, but we only had cornstarch in the pantry so we went with it. Despite its soupy appearance, this pie still tasted pretty darn good! 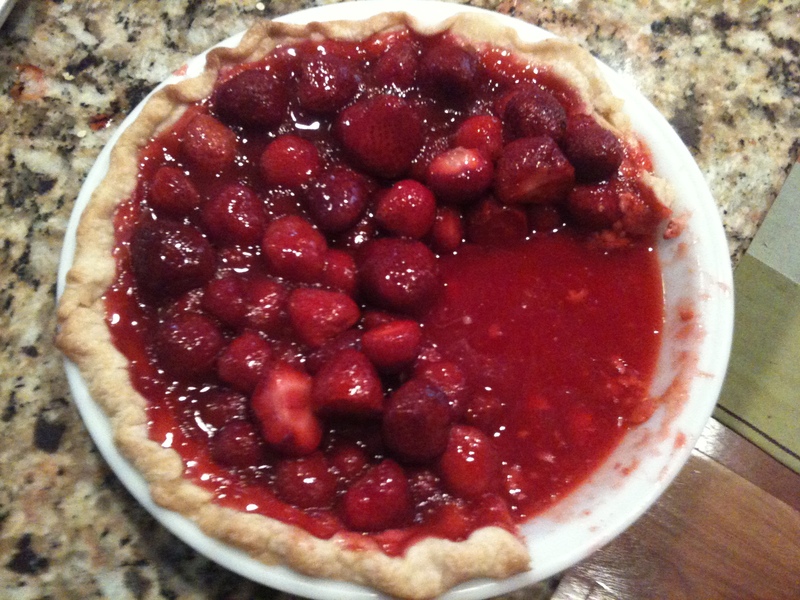 *My apologies for the crappy picture – someone (who thinks 1/4 of a pie equals 1 serving) couldn’t wait to eat it! 1. Make enough of your favorite pie crust recipe for 1 bottom crust. I prefer an all-butter crust, but you use whichever you like. I’ve seen recipes for this using a graham cracker crust but I think a standard flour and butter crust will hold up to the strawberry juice better. Bake off your crust and let cool. 2. While the crust is cooling, hull enough of the strawberries to fill the bottom of the crust in 2 layers – you want the strawberry level to be roughly even with the top of crust, but slightly higher. Use the nicer-looking and bigger berries for this part and arrange them somewhat nicely. 3. For the remaining strawberries (~1 pound), hull and slice into halves or quarters, depending on their size. If you have any overripe or ugly berries, use them here. Combine these with the water, sugar, and cornstarch and bring to a boil. As the mixture is coming to a boil, mash the berries with a spatula or spoon as best you can. Reduce the heat to medium, and simmer until the mixture thickens substantially (about 5-7 minutes). 4. Let the strawberry sauce mixture cool for a 5-10 minutes (it will continue to thicken as it cools). After waiting, pour the mixture through a fine mesh strainer over the fresh berries in the crust. Cool pie in the fridge for at least 2 hours. 5. Once chilled, serve pie with a dollop of fresh whipped cream. This is best served the same day it’s made or the next day (if it lasts that long). Enjoy! Last week, a friend and I made Ina Garten’s Lemon Yogurt Cake and Deb’s Key Lime Meltaways. Both great, classic recipes that I will use over and over again. The lemon cake is moist, tart, and the edges have a delectable lemony kick to them from the lemon/sugar syrup that soaks into cake (the end pieces were the first to go, naturally). The key lime meltaways are simply heavenly – I could scarf down 10 of them in a sitting, no problem. Next time, I might try adding things to the lemon cake – like the optional glaze (more glaze is not optional in my book…it’s a must! ), and maybe some blueberries or raspberries. It seems that all the kids in my neighborhood have outgrown their Girl Scout memberships – that’s a shame, because I could really use a year’s supply of Thin Mints, Samoas (or their politically correct twin, the Caramel De-lite), and Tagalongs. Do you think that girl is still selling them on YouTube? In any case, when I couldn’t get my hands on the real thing this year – I decided to make my own. How’d they turn out? I’m still trying to answer that one for myself. let me have the recipe already! Once upon a time, I did not like pie. When I think back to all those pie-less years of my youth, I die a little on the inside because what I was really missing out on was crust. I freakin’ LOVE crust. Naturally, last weekend when we made an apple crumb pie, I made a whole crust recipe (Joy of Cooking – basic shortening crust) knowing full well that I would use the other crust if I had it. By last night, it was practically calling to us from the fridge – please! bake me! put me to good use! OK FINE. If I have to. Lacking the necessary ingredients for any real pie, we ended up making tiny, baby pies with jam – because everyone knows that things taste better in miniature form. Really, they were more crust than filling – and that’s the way I like it. All you need is a crust, already chilled, and some of your favorite jam or jelly. When it comes to baked goods, especially those that I make myself, I tend to lean towards the simple variety, the comfort foods of baked goods, if you will. You know, stuff that your grandma probably makes – nothing over-the-top but just simple, maybe elegant, home baking. So, when I found an old recipe for hermit bars, clipped out of a newspaper years ago and shoved in the “recipes I might one day find again” box, I instantly desired to make them. If you haven’t had hermit bars – and, it’s surprising how many people haven’t – they’re typically a chewy molasses cookie in bar form, usually (hopefully) with raisins. Mine turned out quite well, if I do say so myself – thick, chewy, a bit spicy, and with a satisfactory hermit-to-raisin ratio (read: raisin in every bite). I’ve never been a huge fan of regular cheesecake – it’s a bit too rich for me and, honestly, I like the crust more than the actual cheesecake filling. But, if I could have a small bar of cheesecake, with equal amounts of graham cracker crust and cheesecake filling, maybe then I could enjoy it. Every 4th of July, my mom gets dessert duty at our friends’ cookout. The first year that I helped, we made a triple-layer (red, white and blue) cake, decorated by moi in frosting fireworks. A few years ago, we made Neopolitans with blueberries and raspberries. 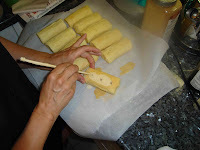 So last week, I recieved an email saying, “The theme for this year’s cookout is ‘tubular’ – what kind of desserts can I make that are tubular? ?” I didn’t have an answer for her. 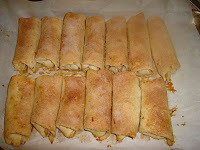 After much deliberation, she decided on Apple Pie Burritos and Homemade Twinkies – you can’t get much more American than that! Peel the apples. Grate into a bowl with the coarse side of a cheese grater. Mix the sugar and cinnamon together. Make sure it’s the color you want it to be. Not too much cinnamon, but enough. Mix the flour into the sugar and cinnamon. Throw in some salt – 1/2 tsp or so. Put sugar mix into the apples and stir them together. Wrap the tortillas in plastic wrap and nuke them for 30 seconds or so. You want them to be pliable for wrapping. Place a warm tortilla on your work surface. Lightly butter each side. Note the consistency of the apples – little shreds. Slices broke the tortilla. 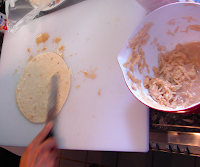 Put the filling on the bottom third of the tortilla and roll like a burrito. Bake at 350 degrees for about 30 minutes – until they look lovely and golden brown. I heard these were quite the hit! 1. To make the cake molds: Find a small, longish jar to use for the mold. Take a piece of aluminum foil that is about 12″ X 14″. Fold it over twice (once in each direction). Wrap the foil around the jar so that it is like a little boat (long side is opened – see picture). Make 12 of these and put them in a pan or on a cookie sheet or jellyroll pan (I used a pan so that they wouldn’t oooooggg over the sides). Spray the molds with cooking spray. 2. For the Cake: Ignore the box instructions. Mix the cake mix with the water. Beat the egg whites until stiff. 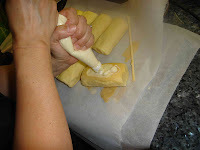 Fold them into the cake batter, then beat on medium speed til smooth. 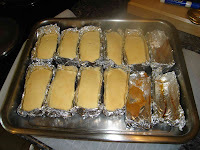 Pour the batter into the molds, filling them about about 3/4 full. 3. Bake for 30 minutes, or until a chopstick (or toothpick) poked halfway through comes out clean. 4. Take the cakes out of the molds and let cool. 5. 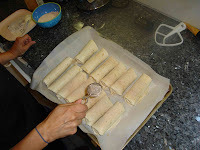 Make the filling: Mix flour with milk and boil until thick. It will be very thick. Set aside to cool. Beat the milk/flour stuff until fluffy and add other ingredients one at a time beating well after each addition. 6. Prep the cakes: Take a chopstick and poke 3 holes in the bottom (it was the top when you baked it) of each “cake, going only about 1/2 way through. Angle the chopstick in so that you can dig a little channel between the holes. 7. Do the filling: Put whatever tip you want on the pastry bag. Fill it with the filling. Squirt the filling into a hole, angling it so that it travels down the channel. Fill all the holes. Fill all of the twinkies. 8. 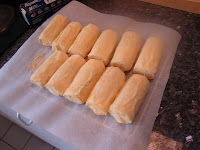 Wrap the twinkies in Press&Seal wrap for at least a few hours so that the cake becomes more moist. 9. THEN stack them as shown. 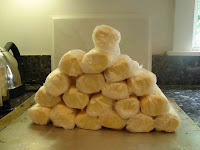 Since the ingredients in this are not mined or artificial, you can even call this a FOOD PYRAMID! I’ve been informed that the twinkies were a HUGE hit with all the men at the party.